UAE++ offers an effective way to represent your business to our users throughout UAE. Thousands of people use FreeUAEdirectory.com to decide where to eat, play, stay, entertain and find job and to find all UAE Companies contact information details. When you advertise your business on our Website, you put your information in front of active consumers who are already looking for businesses like yours, in UAE. FreeUAEDirectory presents you with advertising options for your convenience. All our advertising options are effective and are only differentiated with the type of visitors. You can choose the right target for your advertisements by choosing the suitable advertising plan. Unlike the costly pay per click advertisements, banner advertising with freeUAEdirectory.com is a fixed one time charge. You can pay the advertising charge for the selected plan and your advertisement will remain at the site for the chosen period. You don’t have to pay for the number of clicks. 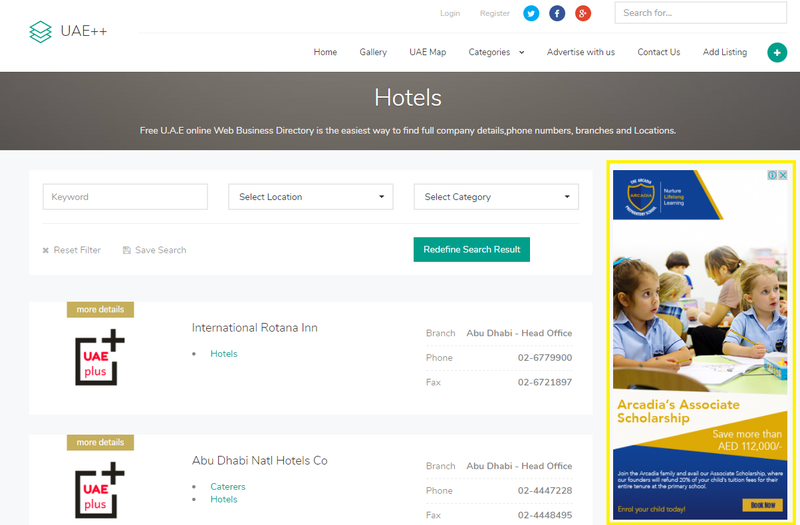 You can place banner ads in the homepage of FreeUAEDirectory.com which is open to public and hence placing an advertisement in the homepage will attract more than 200,000 Page view/month at FreeUAEDirectory. The visitors include Members, Traders, and Buyers in UAE. You can choose from the options below. By choosing this advertising plan, you can place banner ads in all the pages of UAEplusplus.com.